Whether your favorite outdoor living space is your yard, garden, or patio, these beautiful seahorse wind chimes will be music to your ears. The exquisite design will catch cool summer breezes and the eyes of family and friends. 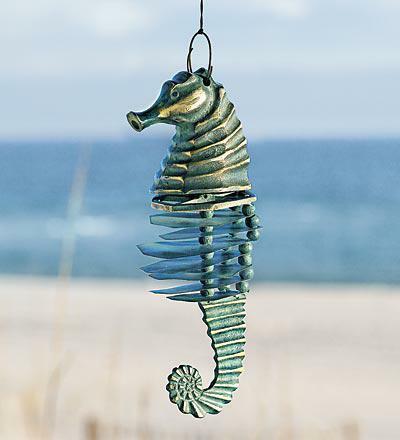 Made of natural verdigris and polished brass, this most magical of sea creatures will surely add some sea life to your favorite outdoor spot, or dress up your motor home for that summer road trip. For more information or to order, click here.